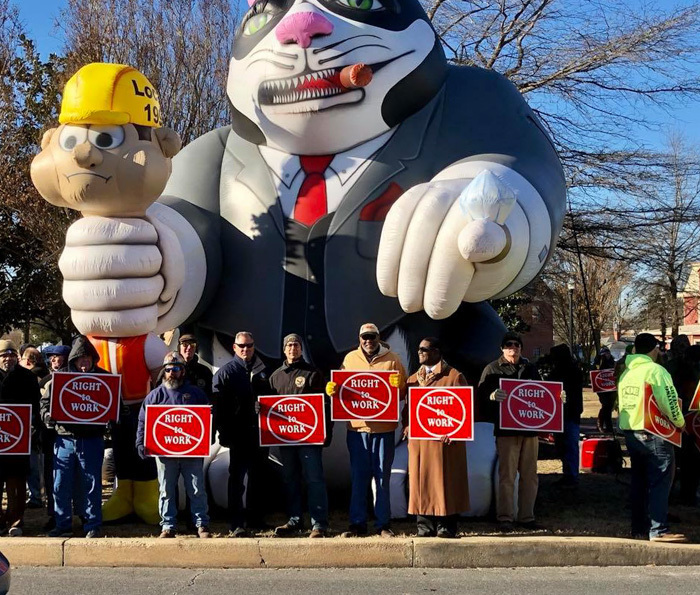 MEMBERS OF LOCAL 13 (Philadelphia) and Local 193 (Baltimore) joined forces with other unions Jan. 2 to protest a right-to-work proposal before the Sussex County, Delaware, County Council. Councilman Rob Arlett introduced the measure in October, billing it as necessary for the county's economic development. After a five-hour public hearing on Jan. 2, the council pushed the vote to January 9, when the measure was defeated four to one. Pictured above are Local 13 members outside the county courthouse. Starting third from left, l. to r.: Tony Ciferni, Ed Harkins, John Bland, BM-ST Martin Williams and Martin Willis.